I was in Warsaw for a couple of days last week, a city with a strong shoemaking tradition, a smaller group of tailors and a couple of great glovemakers. It was particularly interesting to learn about how tailoring fared in this area under Communist rule, and how it has developed since. The craft suffered a big blow after World War Two, as many of the local tailors were Jewish and didn’t survive. However, being behind the iron curtain for the next 40 years had its advantages, as Poland wasn’t as exposed to the explosion of readymade clothing. The biggest problem tailors had under Communist rule was a lack of good cloth. Poland used to be a big weaving centre, around Lodz. But that shrunk in the 50s and 60s, and tailors usually charged just ‘for the needle’, for the making of a suit. Customers were expected to bring their own cloth. Tadeusz Kierepka, an old establishment tailor that I met, used to make for a lot of the diplomats in the city. Brazilian clients, in particular, pushed him towards making entirely unlined jackets, which he said were very similar to the Caliendo jacket from Naples I was wearing. When the Iron Curtain fell and Poland became independent, the demand for tailoring plummeted as consumers scrambled for western, high-fashion clothing. “Those were the truly bad years,” says Tadeusz. Most tailors survived by making adjustments only, and today one of the problems bespoke tailors struggle with is shaking off that association, convincing people they are a luxury service. 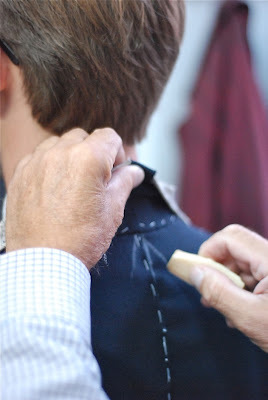 Because there was no demand for bespoke in the 90s, quality fell, and another problem today is that tailors are used to taking shortcuts – fusing some areas (though thankfully not the chest) and skipping the basted fitting. What was the point, when customers didn’t appreciate a superior fit? There is a bit of renaissance of bespoke in Warsaw, as in many parts of the world. Bloggers have been central to this, with Wojtek ‘Macaroni’ Szarski the first and others such as Roman Zaczkiewicz an enthusiastic following. 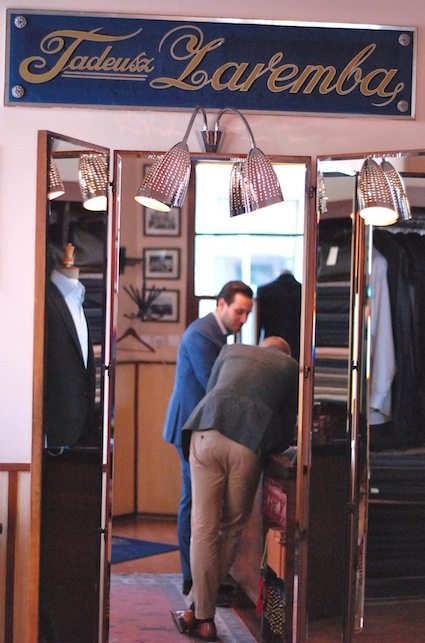 The bespoke tailors I visited said they see a much larger number of young people, particularly lawyers, who have (or think they have) a much better understanding of bespoke. I visited three tailors in Warsaw, of about 10 operating in the city on some scale, however small. Tadeusz, pictured above, is a lovely man and a pillar of tailoring community. The suit he is wearing is 20 years old – as you can see by the position and shape of the lapel notch. He apologises that he has lost weight and so it doesn’t fit as well as it used to. He uses some small amount of fusing, around edges and cuffs for example, and has two people working for him – one a young Italian called Alessandro who is extremely keen. Mazurczak and Trzaska of Gest Moda are also establishment tailors. They used to run Moda Polska, the state tailoring service during Communist times. There are just two of them, doing all the cutting and making, in a little room divided in half by a curtain. I saw a fitting taking place and Wojtek wearing two of their jackets, both of which fitted beautifully. Some of the finishing, such as buttonholes, may not be the finest but they certainly know their trade. 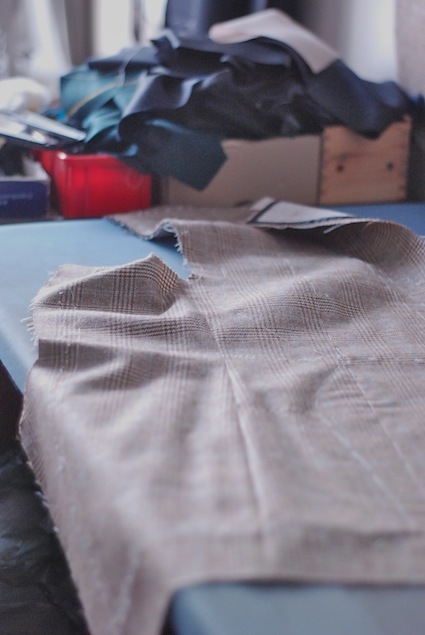 In common with most tailors still, they charge separately for the tailoring (around £600) and for the cloth. So great value if you have cloth and want a well-fitting jacket. Finally, Zaremba, the biggest and certainly most modern of the tailors. Maciej Zaremba inherited the business from his father three years ago. Both are salesmen, not tailors, but Maciej certainly knows his style (apparently it has come a long way from his previous life as a DJ). 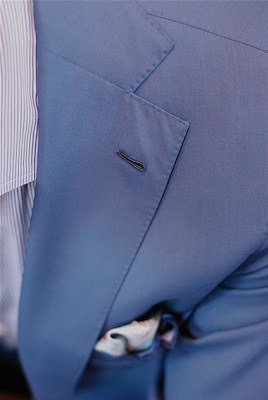 He makes both a clean, softly structured jacket for local lawyers and businessmen and a much softer, Neapolitan jacket (in blue, below). This features inset sleeves, pick stitching and Milanese buttonholes – all things he has seen for himself and helped his tailors to carry out. 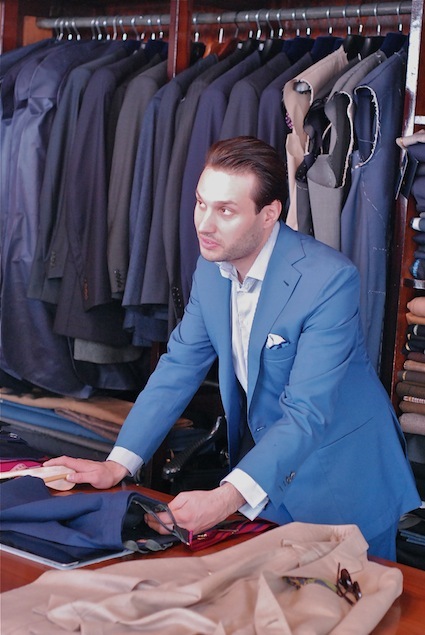 Maciej has three tailors and one trouser maker working for him, though at the moment his biggest problem is too much demand and not enough tailors. It is extremely hard to find anyone in Poland who wants to enter the tailoring trade, and bespoke is not big enough or glamorous enough yet to attract them. One other piece of good news though – Macaroni has just opened his own shop, called Macaroni Tomato. It is a beautifully appointed place, stocking Italian chinos, cashmere handkerchiefs and unstructured jackets. He has real taste, and this comes across strongly. Interestingly, he has opted to stock a huge number of readymade suit sizes, including both six and seven-inch drops, longs and regulars, from which customers find the best fit and then select the cloth they want it made in. Comprehensive adjustments are also made afterwards. It sounds like a good alternative to MTM. You can follow the discussion on Warsaw tailors: Zaremba, Kierepka and Gest Moda by entering your email address in the box below. You will then receive an email every time a new comment is added. These will also contain a link to a page where you can stop the alerts, and remove all of your related data from the site. I want to thank you for this article, and in advance for the rest of the series. Being Polish but living in England, I had no idea there was any sort of heritage of tailoring or of shoes in Poland, and am even more shocked to find out that demand is currently outstripping supply at the Warsaw tailors. The ‘strong shoemaking tradition’ of which you speak also came as a surprise. I always think of Poland as a little behind in terms of style; certainly behind western Europe. It’s an area we are just beginning to discover. I look forward to reading the rest of the series. Interesting article. There was a similar one in New York Times recently about revival of hand made suits. thanks for the post. One could say there is a renaissance of bespoke tailoring in Poland. Apart from the abovementioned tailors there is also one worth mentioning – Turbasa in Krakow. 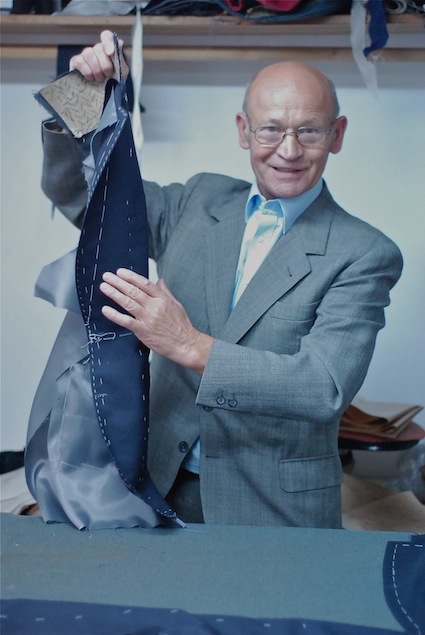 His father Jozef Turbasa, the founder of the company, was a true master and a legend of bespoke tailoring in Poland. They still sew beautiful garments. Well, actually this does not seem to be true, as most tailors that I know in Warsaw are missing the old stuff from Bielsko-Biala, which – in their opinion – had a very high quality (judging by the NOS they sometimes still have this actually might be true although it definitely was not a modern S120-type fabric). On a side note: Lodz was more about sewing and not fabrics. Furthermore there are more active tailors in the City (i.e. more than 10) although many of them are not “popular” or well known. Thank you. Perhaps Bielsko-Biala and Lodz became confused. And yes, I saw some of the old fabric, it was great although very hard-wearing stuff. Times are changoing. It seems that people have enough disposable goods “made in China” and are looking for more durable products produced locally. Hello, this is Venu. I applied my TRC in Warsaw. I am looking for tailoring job. I am having a total of 11 years of experience in tailoring as making pants, shirts and ladies dresses and kids dresses. Please let me. If any tailoring job. Thanks. I get what is the point of fusing in the chest or lapels but what is the point of it in vents,shoulders and cuffs? Do they add the fusing between the lining and the fabrics? How does it work in the shoulders?